Kiersten Heyl was taught how to play the drums by his father at age 6. 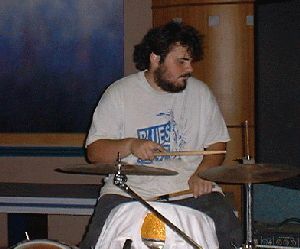 He began playing drums out at gigs around the same age. It wasn`t until many years later that he became interested in piano. At age 14 he was taught a few basic parts on the key board, again, by his father. He played Blues Fest for the fist time in 1995. It wasn`t until after Blues Fest 96, that he began playing with the band regularly. He has been playing with them ever since. Kier was on his first CD, "Aaron Love and his TV Band" at age 16. He also appeared on TV promoting the CD and Blues Fest. He`s played at Blues Fest 95, 97, and 98, and hopes that he`ll play again in 99. Besides playing Music, Kier has several other interests. He`s involved in the Scociety for Creative Anachronism. He`s an avid role player, and loves games of all sorts. Kier is the graphics artist for Delta Boogie. He has become a favorite at Delta Blues Festivals because of his sketches of the musicians.